Even identical twins will usually have different amniotic sacs, different placentas and different umbilical cords. This was not the case of babies Jillian and Jenna Thistlethwaite. In addition to sharing a birthday, these identical twins literally started sharing things immediately following conception. The baby girls were born sharing one amniotic sac and one placenta, an uncommon condition known as monoamniotic, or "mono mono" twins. The chances of having "Mono mono" twin births range from 1 in 35,000 to 1 in 60,000. Some obstetric personnel working in a delivery setting may never have the opportunity to view this type of unique pregnancy, delivery and birth. The condition is not without health risks, however. Because each twin has its own individual umbilical cord but shares the same amniotic sac and placenta, they run the risk of having umbilical cords entangle. If umbilical cords become entangled, this could compromise nutrients and oxygen being delivered to one or both twins. Fortunately, this was not the case with the Thistlethwaite daughters. 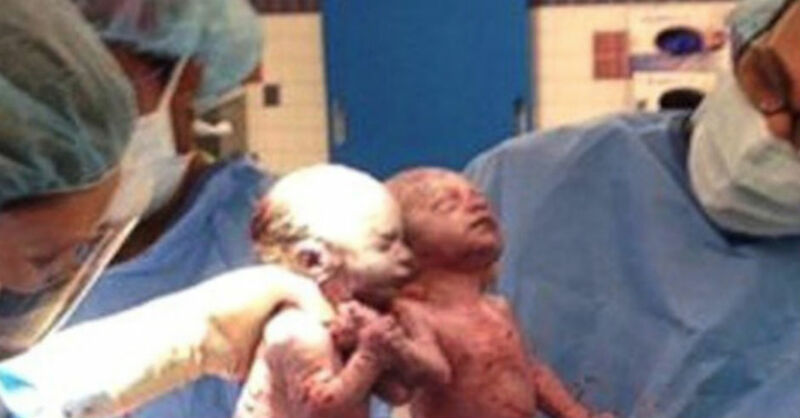 If the monoamniotic condition did not surprise their parents enough, the twin girls were also filmed holding hands immediately upon birth(something these doctors have never seen). After spending all that time sharing essential maternal parts and space, it is not surprising that they still want to be connected. Now only time will tell if they will share their toys and their clothing so easily in a few years.